When I heard about a collaboration between Stone & Sierra Nevada, I knew immediately that I had to get my hands on it. It's an Imperial IPA, that was brewed in two batches. The first batch was split in two, half spent time in gin infused bourbon barrels. while the second half lived in rye whiskey barrels. They were then blended with a fresh batch to produce NxS. 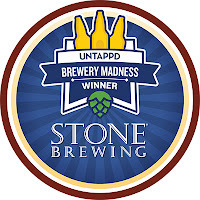 This badge is for the winner of the first Untappd Brewery Madness Winner; Stone Brewing. The 64 most consumed brewers in the U.S. were pitted against each other, in much the same way as the March Madness NCAA Basketball tournament, with Stone eventually being declared the winner. 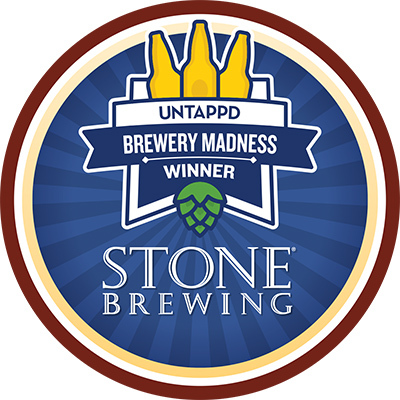 You've got until the end of April to check-in to any Stone beer if you want to unlock this badge. Firstly, apologies for the photo - this whole reviewing every badge is proving difficult to predict when I need to pull the camera out. The beer pours a light orange, deep golden colour which is partially cloudy. The head is pours a cream colour, with several large bubbles present from the off. Despite this, the head retention is reasonable with a thin quarter finger of head covering the beer for the duration of drinking with moderate lacing left behind. Onto the nose and naturally it's packed with hops. Citrus is the most prominent, while pine also plays a significant role. There is a noticeable woodiness, while whiskey undertones are also detectable as the beer warms up. The malt base is predominantly caramel malts and appears to be slightly sweet. At first there is plenty of pine and citrus flavours from the hops, and plenty of bitterness that compliments a slightly sweet caramel malt base. The woodiness is muted at first and becomes more prominent as the beer warms. For me the gin element is far more evident to taste than the whiskey. This beer is never going to be brewed again. I'd bought it purely because of how much I rate both breweries. I would encourage any of you that come across it to do the same. 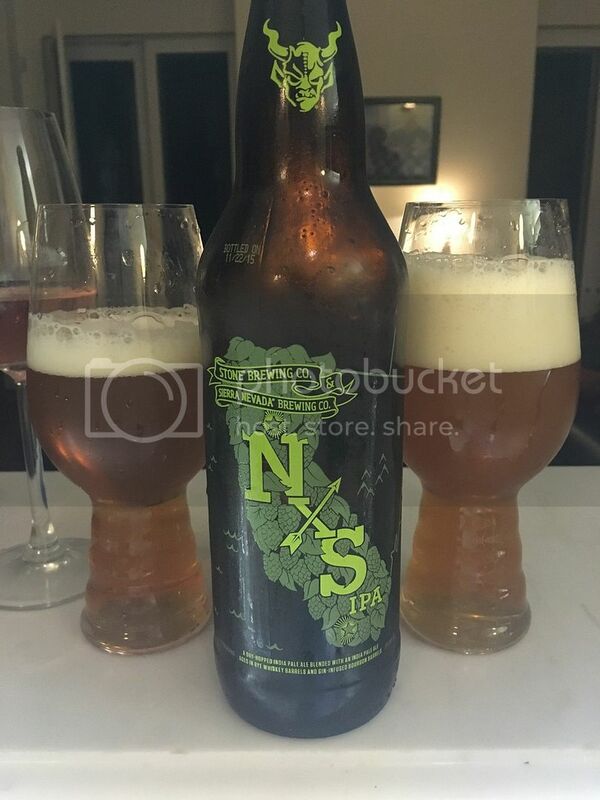 It may be losing it's hops by now, but this beer has much more going on than other IPA's - it's so much more than a hop bomb! It's far more complex than my review would indicate.